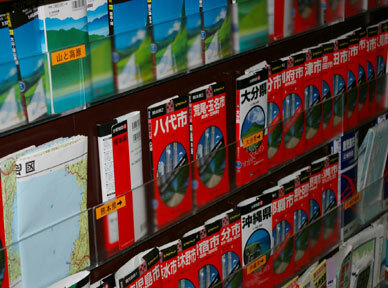 Although available at bookstores through special order, residential housing maps of areas outside the city limits of Fukuoka, are surprisingly hard to find. On the 2nd floor you will find a section devoted to maps. 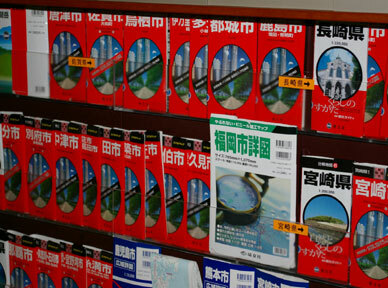 Maps in this section include housing maps of all prefectures in Kyushu, housing maps of all Japanese cities designated by the central government, and detailed national road maps, all of which can be useful for business trips outside Fukuoka, as well as for preparing research material on the conditions of remote areas. The section also has topographical and aerial maps of the world that are sometimes hard to come by. As these maps can not be checked out, please make use of our copying machines. For more detailed foreign maps, inquire at the International Materials Division.